In the Aegean Sea region, the land could not support the abundant crops that grew in Mesopotamia or the Nile Valley. The hot, dry climate and the rocky soil were too harsh for grains or vegetables, but they made ideal conditions for growing grapes and olives. Wine and olive oil were highly prized in the ancient world, and Aegean societies built a lively sea trade around these products. They built powerful civilizations, but as in Mesopotamia, barbarian invaders took their toll. The first civilizations that we know of grew up in river valleys where abundant water and good soil made it possible to grow crops in large quantities. As new technology such as the plow made it possible to grow more and more crops on rain-watered lands, however, food surpluses and the techniques of civilization they could sustain were able to spread beyond the river valleys. The growth of empires helped this process, as many different peoples from the river valleys, and the hills and desert grasslands came into greater and steadier contact and shared their knowledge and ideas. In addition, along the shores of the seas and oceans people could supplement agriculture with fishing. In the eastern Mediterranean, these factors all contributed to the rise of civilization on the island of Crete sometime after about 3000 B.C..
Scholars still debate the origins of the original inhabitants of Crete. The earliest evidence of human occupation of the island dates to around 7000 B.C., in Neolithic farming and fishing villages. Genetic evidence suggests that these earliest inhabitants probably came from Anatolia (modern-day Turkey) or the eastern Mediterranean coast, and Greece, though they were not Indo-European speakers. By about 2700 B.C. the Cretans were using bronze and establishing larger and larger population centers. By about 1900 B.C. they had established a strong and prosperous Bronze Age civilization based on great palace complexes, the most famous of which was at Knossos. Historians have named the civilization Minoan, after King Minos of later Greek mythology, who may or may not have actually existed. According to Greek legend, the son of King Minos, the half-human, half-bull Minotaur, lived in a labyrinth on the island of Crete. There he devoured sacrificial victims provided by the subject city-state of Athens on the Greek mainland. Minoan palaces with their many bedrooms, bathrooms, kitchens, storerooms, audience halls, corridors, stairways, and multiple stories might easily be described as a labyrinth. Our real knowledge of early Minoan history, however, depends primarily on archeological discoveries. Apparently inspired by Egyptian hieroglyphs, the early Minoans developed their own written language, preserved on clay tablets in a script modern scholars call linear A, but we do not yet know how to decipher it. Later, however, Minoans came into contact with Indo-European groups migrating into the Greek peninsula and the Aegean islands and soon a new form of writing appeared in Minoan palaces. Scholars call this new writing, which is an early form of Greek (another Indo-European language), linear B. These tablets detail the administration and government hierarchy in Crete’s later period. At the top of Minoan society stood the rulers of the various palace complexes. Apparently they were absolute rulers and governed all aspects of Minoan society. Toward the end of Minoan civilization, the king at Knossus seems to have become ruler of the entire island. Below the kings were the great mass of ordinary people, including artisans, merchants, farmers and herders, and a specially trained class of scribes who served as the ruler’s bureaucracy. There is little evidence of slavery. Judging from the lack of weapons displayed in their art or found in their tombs, Minoans were not warlike and apparently felt no need to fortify their cities. Although Crete lies within an active fault zone, and suffers numerous earthquakes, the Minoans built and rebuilt buildings that were both technologically and artistically advanced. Sometime around 1700 B.C., for example, the great palace complexes were apparently destroyed, probably in a major earthquake, but the Minoans rebuilt and even expanded them. Most families had timber and stucco houses. The royal and noble families also had indoor running water and lavatories. Homes were often decorated with magnificent and remarkably modern-looking frescoes, paintings made directly on the plaster walls. Many frescoes depicted animals and plants from Mesopotamia and the Nile Valley, suggesting trading contacts with these other regions. Minoan women probably had equal status with men. Minoan frescoes show women as well as men leaping over bulls in special bullrings, and participating in boxing contests, as well as all other activities in which men were also engaged. The center of Minoan religion was the Mother Goddess, whose ritual worship was performed by priestesses. The religion seems to have been concerned most with fertility and the natural cycle of life, death, and rebirth. The Minoans primarily made their livelihood and built their civilization by taking to the sea. Excellent sailors, they traded widely, bringing Crete and the other civilizations of the region into closer contact. Although too harsh for growing grain on a large scale, the climate of Crete was ideal for growing olives and grapes, and the Minoans grew rich trading olive oil and wine, as well as grain, wool and other products of a mixed farming and pastoral economy. They established trading posts in Greece, Sardinia, and Syria, and in the Aegean islands; they may even have traded as far away as the western coast of Europe. The decline of Minoan civilization probably began with a major natural disaster. Sometime in the 1620s, a massive volcanic eruption occurred on the nearby island of Thera, about 70 miles north of the Cretan coast. The explosion was so powerful that it created a tidal wave that flooded much of Crete. The cloud of hot ash that spewed from the volcano ruined farm fields and burned many Minoan cities, as well as changing weather patterns for several years. Although the Minoans rebuilt after this disaster, it must have weakened them. 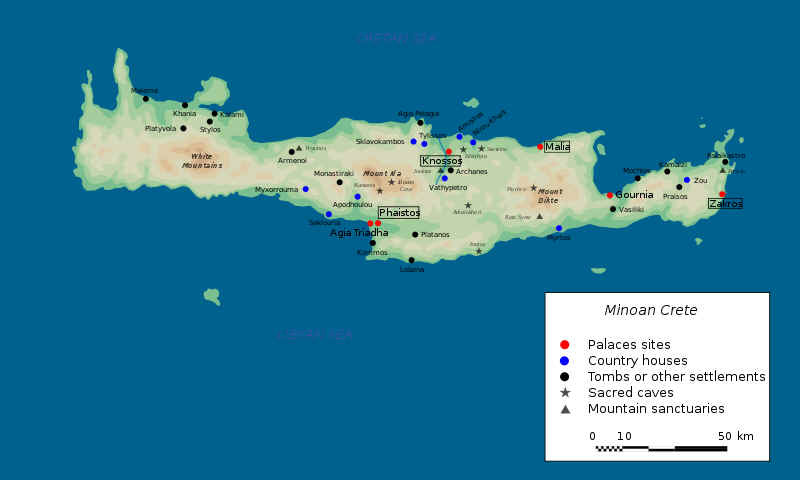 At any rate, around 1550 all the Minoan palaces except Knossos were destroyed—Knossos too was burned about 1375—probably by the Indo-European speaking peoples who had migrated into Greece and established their own civilization sometime after about 2000 B.C..
As early as the mid-6000s, small Neolithic farming communities had appeared in Greece, and after about 3000 B.C. people in the region had learned to make and use bronze. Small towns appeared, both on the mainland and in the islands, some fortified with walls. Scholars still dispute who these early inhabitants were, but they agree that around 2300 a wave of Indo-European migrants from Asia Minor arrived in Greece, speaking an early dialect of Greek. Whether the arrival of these people affected the emergence of Minoan civilization is unknown. Their own culture, however, soon showed distinct signs of Minoan influence. The Mycenaeans. By about 1700, these early Greeks had begun to build fortified citadels at places like Athens, Pylos, and Tiryns, from which they commanded the surrounding countryside. Their most important city was Mycenae, a city built on an easily defensible rocky hill at the intersection of two important trade routes. Consequently, scholars call this Indo-European civilization in Greece Mycenaean. The Mycenaeans clearly interacted with the Minoans for a considerable length of time and eventually adopted at least some of their culture. Many scholars believe that it was a Mycenaean invasion that destroyed the Minoan cities and took over the palace at Knossos. Thereafter, Mycenaean kings began to run their own economies in much the same way as the Minoans—highly centralized and overseen by a specialized bureaucracy—and to keep their own palace records in the linear B script. Mycenaean traders also seem to have replaced Minoans along the trade routes of the eastern Mediterranean and Aegean. Mycenaean society. Like the Hittites, the Mycenaeans also reflected their Indo-European background in the kind of society they built. Warrior kings dominated society, supported by nobles who exchanged their military service for lands and favors from the king. Below this warrior aristocracy, artisans and craftsmen produced pottery and other luxury items such as jewelry and inlaid metalwork. 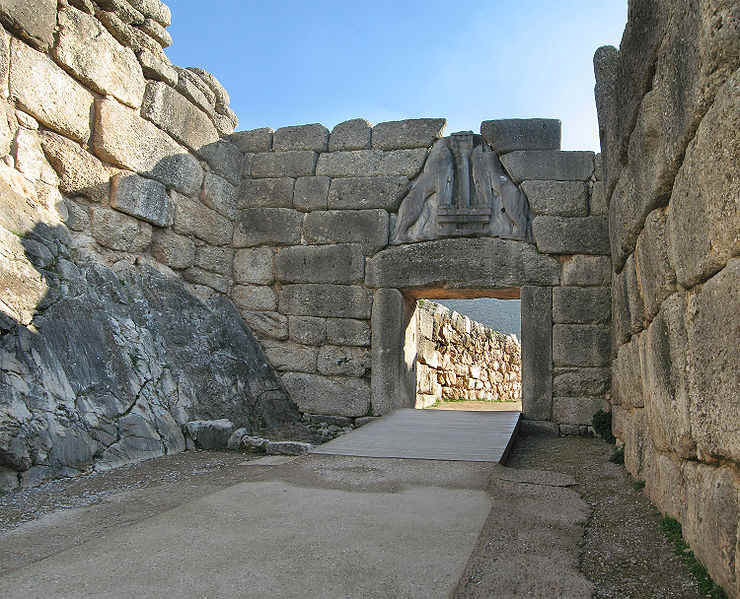 Mycenaean architects built impressive palaces and other works such as bridges and a fine network of roads. Merchants handled overseas trade, often on the king’s behalf. At the bottom of society, peasants and slaves kept the herds and tilled the soil. The palace bureaucracy, who kept detailed records, oversaw everything. Perhaps our best picture of Mycenaean life is preserved in the great epic poems attributed to the later Greek poet Homer, the Iliad and the Odyssey. From Homer we know that the Mycenaeans worshipped Indo-European gods, headed by the sky god Zeus. Other important gods and goddesses such as Hera, Athena, Apollo, Diana, Hephaestos, and others all represented some particular aspect of nature or creative activity. Sacrifices were made to the gods in the form of burnt offerings of animals, and on occasion even human beings. From both Homer and the archeological record, we also know that warfare was an important element in Mycenaean society. Royalty and nobles were buried with bows and arrows, swords, daggers, and shields. Scenes of battle adorned the walls of the palaces. Mycenaeans also used horse-drawn chariots, though given the rocky terrain they were probably more a status symbol than anything else. Homer most often depicts warriors fighting on foot. In the mountainous terrain of Greece, the various Mycenaean cities remained largely independent, although the king at Mycenae eventually presided over a kind of loose federation. Even then, the cities often made war on one another. Because the Greek mainland offered relatively limited resources, like the Minoans the Mycenaeans turned their attention to the sea trade. At the height of their civilization in the 1400s and 1300s B.C. they controlled trade in the eastern Mediterranean, and through middlemen their goods traveled as far as England and southern Russia. They only traded actively with the Egyptians, however, during the reign of the pharaoh Akhenaton, who was more open to foreign influences than either his predecessors or successors. After the Trojan War Greece was still subject to migrations and settlements, so that it could not enjoy the tranquility needed for growth. Thus the Greek return from Troy was long drawn-out and caused many revolutions. The country had no settled population; on the contrary, migrations were of frequent occurrence, the several tribes readily abandoning their homes under the pressure of superior numbers. My riches are spear, sword, and stout protective shield; with them I plough, with them I reap, with them I tread the sweet wine from the grape, with them I am entitled master of the serfs. One of the most lasting effects of these invasions was the disruption of trade. The Dorians also looked down on farming and often turned conquered peoples into serfs to grow crops for them. As other Indo-European tribes followed the Dorians, they too displaced the older inhabitants of Greece. In the ensuing chaos of migrating peoples, Mycenaean civilization practically disappeared. Only ruined hilltop fortresses, soon weathered by wind and rain, and covered over by earth, were all that remained of it—except for tales told by poets like Homer. These were repeated for centuries and became the basis of later Greek mythology. In the meantime, however, literacy and the other fruits of settled civilization largely disappeared as Greece and the Aegean region entered what modern scholars call the Dark Age.